Colorectal cancer (CRC) is the second leading cause of cancer deaths worldwide. Colon cancer models in rodents are valuable tools for the preclinical assessment of novel therapeutic agents. Murine models are particularly useful for studying the fundamental properties of tumors and aid in the investigation of pathophysiologic mechanisms of CRC development. The MC38 tumorigenic epithelial cell line is isolated from mice with colon adenocarcinoma and expresses high levels of human carcinoembryonic antigen (CEA) and has been used across many research studies. Such examples include the 2004 study by Pajtasz-Piasecka et al. that used the MC38 cell line to study the therapeutic potential of a retroviral vector carrying murine interleukin 12 genes (mIL-12); results demonstrated that cells transformed with IL-12 showed reduced tumorigenicity and that mice that rejected the MC38/IL-12 tumor cells were resistant against subsequent introduction to MC38 cells. These results demonstrated potential for this technique for anticancer vaccines. A study released in 2016 by Kodumudi et al. used MC-38 cells to study methods for disrupting tumor-infiltrating lymphocyte (TIL) inhibitors; the most effective observed strategy was treatment with anti- programmed cell death ligand 1 (PD-L1) antibodies which showed increased T-cell infiltration and IFN-gamma production as well as slowed tumor growth. The group concluded the potential for blocking co-inhibitory immune checkpoints in order to improve TIL function and infiltration as an anti-cancer therapeutic strategy. Similarly, a 2016 Cancer Cell article by Tang et al. used MC38 cells to investigate methods of improving immune checkpoint blockade therapy (such as PD-L1 blockade) by targeting LIGHT, a tumor necrosis factor, which typically prevents lymphotoxin beta-receptor signaling, chemokine production and T-cell recruitment. They presented results that suggested LIGHT can overcome checkpoint blockade resistance in tumor by creating a T cell inflamed environment. On a related note another study on immunotherapy that used MC38 cells was released in 2017 (Juneja et al.) establishing PD-L1 as not just a marker of suppressed antitumor immunity as previously believed but as an active inhibitor of CD8+ T cell cytotoxicity. The MC38 cell line (mouse colon) is used to create the CDX (Cell Line Derived Xenograft) MC38 xenograft mouse model. 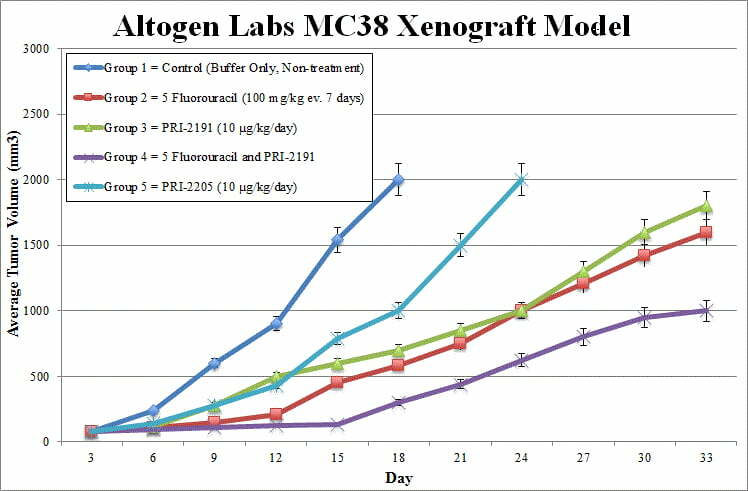 The MC38 xenograft model studies include stimulated proliferation of colon cancer due to exogenous insulin, along with standard anti-tumor studies (e.g. 5-FU, PRI-2191, cathepsin S inhibitors). MC38 cells are maintained at a growth rate of exponential growth leading up to injection. Cells are prepared by trypsinization, with viable cell counts determined via standard trypan blue exclusion with a minimum viability of 98% required. The cell suspension is diluted and each mouse (athymic BALB/c (nu/nu), 9-12 w.o.) is injected subcutaneously in the flank of a hind leg. The injection contains one million cells of Matrigel + MC38 in a volume of 100 µL. Palpation of injection sites occur three times weekly until tumor establishment. Tumors are then calipered until an average size of 50-150 mm3 is reached (per approved IACUC protocol). Animals are sorted into treatment groups; administration of test compounds are performed according to the client schedule. Tumors are measured daily and mouse weights recorded (up to 3 times a week). Animals are euthanized as tumor size reaches 2,000 cu millimeters, or the end of study size limit. Tissue collections are performed. The tumors are excised and weighed, then documented by imaging. Standard necropsies are performed. Tissues are collected for downstream analysis and can be snap frozen in LN2 or nucleic acids isolated. Altogen Labs provides an array of laboratory services using over 30 standard Cell Line Derived Xenograft (CDX) models and over 20 PDX models. Researchers investigating the role of specific proteins or gene products in regulating tumor growth can benefit from development of protein overexpression (genetically engineered to ectopically express proteins, tumor suppressors, or oncogenes) and RNAi cell lines with long term gene silencing. Altogen Labs provides quantitative gene expression analysis of mRNA expression (qPCR) and protein expression analysis using the WES system (ProteinSimple).